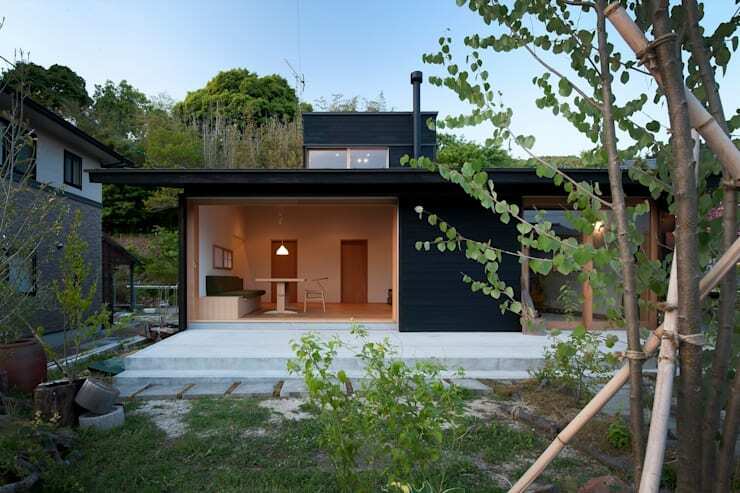 South Africans can learn a thing or two from Japanese architecture with its less is more approach, its minimalist precision and its sleek finishes. This is why we are going to tour a gorgeous home today, where the professionals behind this impressive design have not only made the most of every bit of space available to them, but they've created a minimalist home that is breathtaking in its simplicity. Let us tour this home from the outside in and see how we can approach a slightly simpler lifestyle in our own homes! From the outside of the home, we can see how sleek and modern it is yet how it also works in harmony with the environment that it is surrounded by. It features dark wooden cladding, which open up to reveal a much lighter interior, like a coconut being cracked open. We can also see that it is a very simple cube shape with a flat roof, featuring a little loft area that seems to poke out of the top. This is simple yet effective architecture in its finest. The home spills out onto a cement terrace, which physically expands the small interior. This provides the family with a space to relax and enjoy each other's company in the fresh air, surrounded by the beautiful trees and flowers. If we head inside the home, we come across the simple dining area, made up of a simple wooden table, a bench and two chairs. There is no need for elaborate decor or accessories in this space, which makes the room look that much more expansive. 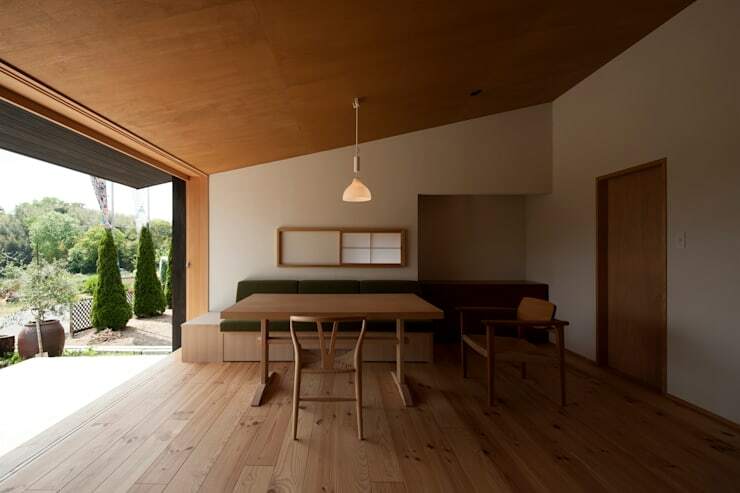 We can also see how the architecture utilises natural light in this image, thanks to the large doors that slide open, connecting the interior and exterior spaces. As we tour each room in this house, we will witness how the natural light works in harmony with the neutral tones, creating a soft, warm and inviting interior design. 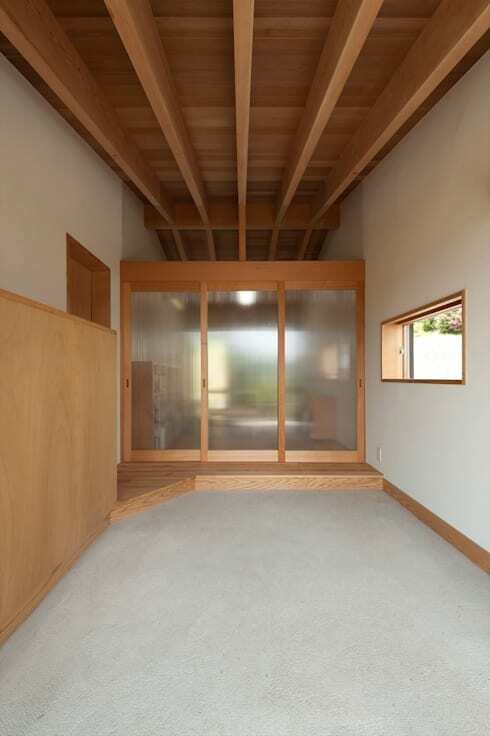 The designers have incorporated a traditional Japanese sliding door into the design, which can be pulled shut to offer the family privacy while they dine or protection if the sun is too hot. Yet, the sunlight is still able to filter through it, ensuring that the home isn't completely blocked off from the outdoors. When the doors are pulled shut, this space feels very serene and peaceful. In this image, we get a clear sense of how the rooms have been carefully divided depending on their function, but they haven't been completely cut off from one another. This allows for a constant flow between the spaces in this house, which makes it seem that much bigger. 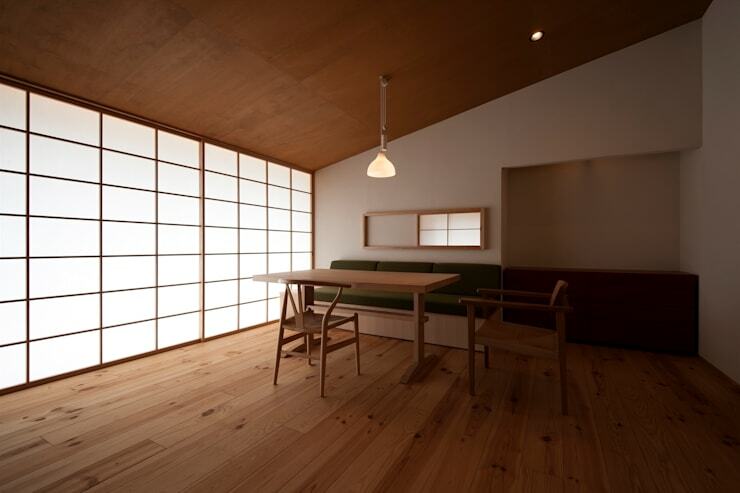 In this room, the division comes in the form of glass sliding doors. This keeps the room slightly separated, without completely disconnecting it from the rest of the house. Have a look at these: tips on how to stylishly split a room without a wall. A large, narrow, rectangle glass window allows sunlight to stream into this space throughout the day. What other decor could you possibly need when you have a window framing the beautiful surrounds like an artwork? 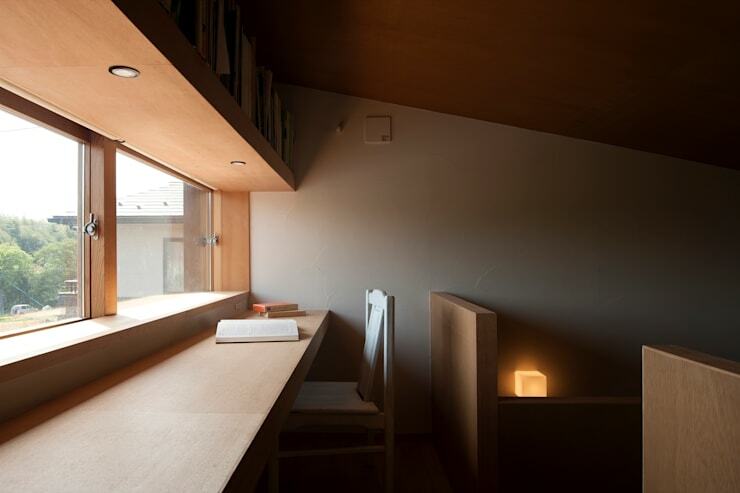 The little loft that we saw from the outside is a space that has been used for a home office and reading room. Because there isn't too much space available, the designers have made the most of the vertical space available to them, installing a vertical shelf along the entire length of the wall just under the ceiling. This shelf has been packed with books and other items that may be necessary for the family. Underneath the shelf, a large glass window runs along the entire length of the room. This gives the residents panoramic views of the surround while they sit at the desk and do their work. Little lamps have also been installed in this space so that it doesn't get too dark. In the kitchen, we can really see how the designers have made the most of the space available. The kitchen is very long and narrow, so the two sides of the room have been utilised for storage space, keeping the room looking neat, minimalist and appealing. Storage space is very important in a kitchen, because there are usually so many items that need to be kept in this space including cutlery, crockery and glassware. 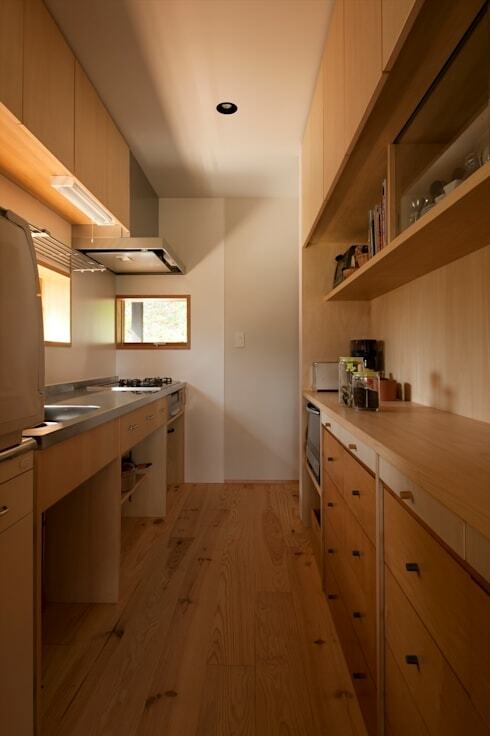 If your kitchen is small, you don't want it littering the place, making it seem more crowded and cramped. Have a look at these: 8 clever ways to improve storage in your kitchen. 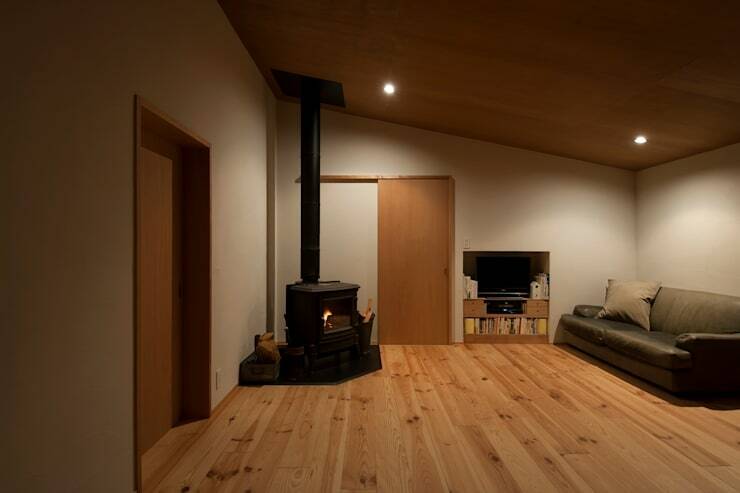 In the living room, the designers have stuck to the purely functional but they've added a fireplace to the design. This is very cosy and homely! This room shows us that going for a simple look and feel doesn't necessarily mean compromising on homeliness or comfort. This room also features a television and a bookshelf packed with books. This gives the family plenty to do while the cuddle up in front of the fire. However, these items are stored neatly away in the alcove of the wall—the key to a minimalist design! What do you think of this impressive home?